Newsha Tavakolian, Portrait of Somayeh, a divorced teacher from Tehran, 2014, as featured in Blank Pages of an Iranian Photo Album (2014). Photograph. Courtesy of Newsha Tavakolian. The Prince Claus Fund Gallery in Amsterdam welcomes you to Newsha Tavakolian’s solo exhibition I know why the rebel sings, running November 27 through March 4, curated by Vali Mahlouji. From war reportage to compelling artistic portraits, I know why the rebel sings takes an unprecedented look at Tavakolian’s photographic œuvre. Tavakolian is the recipient of the 2015 Principal Prince Claus Award. “From the terror of war to the oft-forgotten realities of those forced to pick up the pieces in its aftermath, this expansive exhibition of Newsha Tavakolian’s photography creates a fluid dialogue between her moving coverage of conflicts, her candid exposé of humanitarian tragedies and her aesthetic explorations of life in Tehran, with intimate forays into the private lives of friends and acquaintances. I know why the rebel sings, for the first time, integrates Tavakolian’s stirring warzone images and NGO projects with her more formally conceived portraits. It considers her photographic practice as a whole and examines her journalism as an integral component of it. Meditative journeys of daily experiences in Blank Pages of an Iranian Photo Album and self-consciously staged, ordered scenes of characters in the ‘Look’ series sharply contrast with the raw urgency captured in a bloody ambush in Iraq or the harsh reality of a training camp of Syrian Kurdish female militias preparing to fight ISIS, as featured in On the War Trail. Tavakolian’s journalistic output is considered beyond the narrative and visual strictures inherent in press formats, in relation to the wider themes that inform her oeuvre. Masterfully composed moments of quietude under the omnipotent shadow of terror are highlighted in The Girl in Red. The Girl at the Desk dominates the Ghana room, a moving image drawing attention to the human figure. Iran Walls breaks away from formal serial compositions and creates new visual dialogues across series, allowing for previously unmade connections. 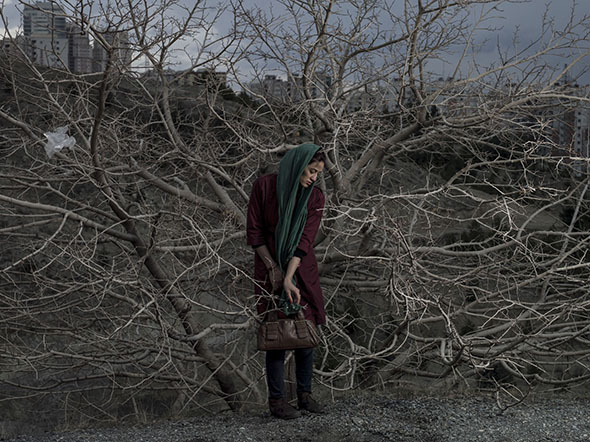 A self-taught photographer, Newsha began working professionally in the Iranian press at the women’s daily newspaper Zan at age 16. At 19, she joined the New York-based agency Polaris Images. She has since covered international conflicts and natural disasters, made social documentary stories and, in 2009, started working on projects that experts describe as a mix of social documentary photography and art. Newsha has been published in international media such as Time Magazine, Newsweek, Stern, Le Figaro, Colors, The New York Times, Der Spiegel, Le Monde, NRC Handelsblad, The New York Times Magazine and National Geographic. Her work has been displayed in dozens of international art exhibitions and has been shown in museums such as the Victoria & Albert, LACMA in and the British Museum, and the Boston Museum of Fine Art. In 2014, Newsha was chosen as the fifth laureate of the Carmignac Gestion Photojournalism Award. In 2015, she was chosen as the Principal Prince Claus Laureate. Newsha became a Magnum nominee in 2015. Vali Mahlouji is an independent curator and writer and advisor to the British Museum on its modern/contemporary Iranian collections. Mahlouji’s recent curatorial work includes exhibitions at FOAM (Amsterdam), Musée d’Art Moderne de la Ville de Paris, MAXXI National Museum of XXI Century Arts, Whitechapel Gallery and Photo London. He is founder of the research and curatorial platform Archaeology of the Final Decade, recirculating art and cultural material that have remained under-exposed or, in some cases, destroyed. Mahlouji has been published by Encyclopædia Iranica; Asia Society Museum, New York; Athens National Museum of Contemporary Art; and Sharjah Biennial, among many other institutions and media. For more information, please contact Sarah Smith, Prince Claus Fund Communications: s.smith [​at​] princeclausfund.nl.